Authentic Bolognese Sauce is a hearty and flavorful meat sauce that is the perfect recipe for Italian comfort food! It might be better to start off talking about authentic bolognese sauce by talking about what it is not. It is NOT a tomato sauce with meat. It is NOT served with spaghetti. It is NOT what we think of in the States when someone says “bolognese”. Now that we have that out of the way, we can talk about what bolognese actually is. Imagine finely chopped beef, slow cooked with aromatic vegetables and pancetta until it is more tender than you imagined possible. 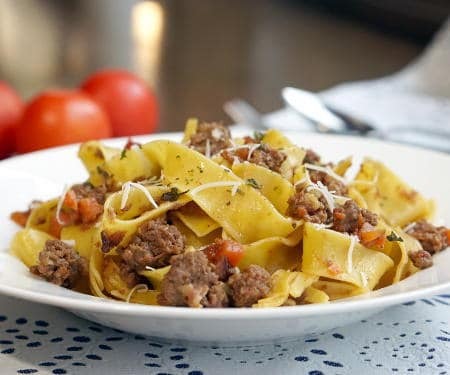 This tender, flavorful meat is tossed with wide pasta noodles, traditionally tagliatelle. The bolognese isn’t loaded on, but it’s there just enough to lightly kiss the tender pasta with the delicate, yet robust flavor of the sauce. Top everything off with some freshly grated Parmiganio-Reggiano cheese. And you are about to find yourself in meaty pasta heaven. What is the difference between bolognese and ragù? Ragù is the name for a group of Italian pasta sauces that are made with a base of ground or minced meat. These are authentic, Italian meat sauces (not tomato sauces with meat). To round out the sauce vegetables and other seasonings are added and sometimes a very little bit of tomato. There are many types of ragù, using different meats and different vegetables. The ingredients in the ragù will depend on the region. The sauce is so crucial to the culture of Bologna, Italy that the Academia Italiana della Cucina (the Italian Academy of Cuisine) officially registered a recipe for bolognese sauce with the Bologna Chamber of Commerce in 1982, see the official version HERE (it is in Italian). That’s a pretty important ragù. There might be an “official” recipe for authentic bolognese sauce, but everybody’s grandmother in Italy makes her sauce differently. 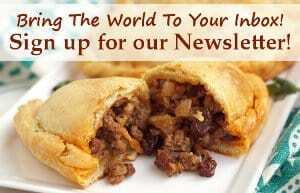 Some use just beef, others use a combination of veal, pork, and beef, all ground or finely chopped. For the light amount of braising liquid, some use broth, some use water, some use wine. 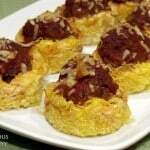 Some use finely diced tomatoes, while others use double or triple concentrated tomato puree. (How we wish that was something we could find here in the States!) Some start with oil, some use pancetta for fat, others do both. 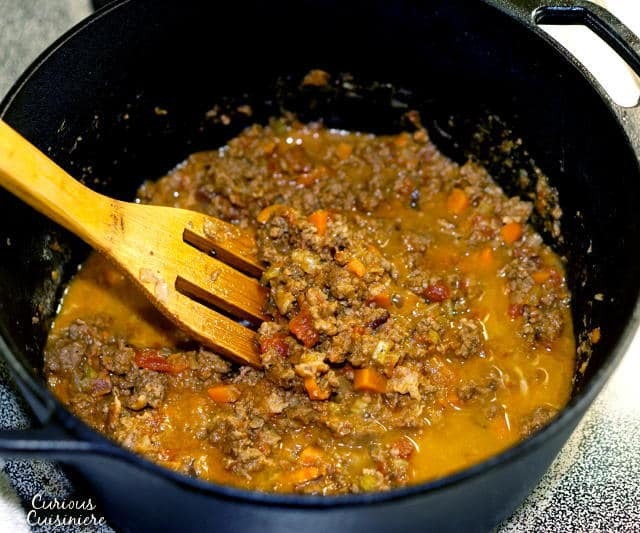 As you can see, there are MANY ways to adapt the recipe for authentic bolognese sauce. We took a look at a number of adaptations and came up with our own version that is close to the official version, but makes things a bit more accessible for those of us cooking in the States. For starters, we used ground beef as the meat in our sauce and opted to add finely diced tomatoes, rather than a concentrated tomato puree. While we initially weren’t sure about using the diced tomatoes, in the end, we found that we liked having the tomato bits in the sauce with the beef, rather than letting the tomato be something that blended completely into the background of the sauce. Next, instead of pancetta, we used regular old bacon. Pancetta and bacon are incredibly similar, the only difference being that bacon is smoked after it is cured, while pancetta is not. If you can get your hands on pancetta, go for it. If not, bacon makes a great substitute that lends a hint of smokiness to the sauce as well. The pasta used with an authentic bolognese sauce is VERY important. So important in fact that, as we mentioned earlier, the sauce isn’t even called “bolognese” in it’s home region. Rather, it’s referred to by the type of pasta used. So what is the pasta? 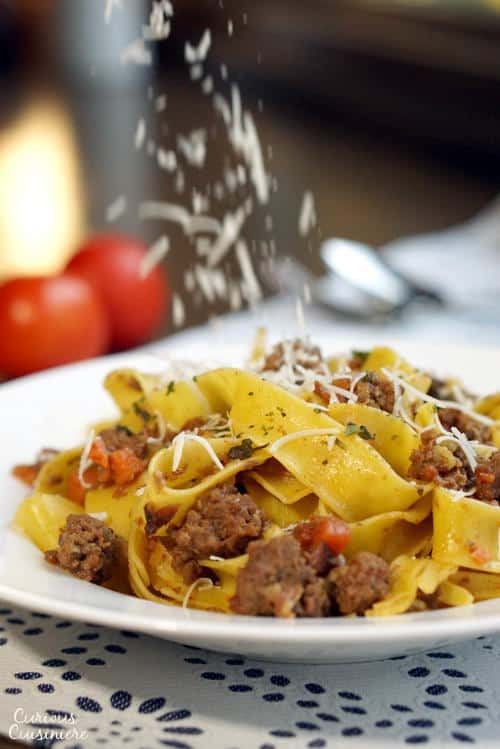 Traditional bolognese is served with tagliatelle pasta, hence “Tagliatelle al Ragù“. 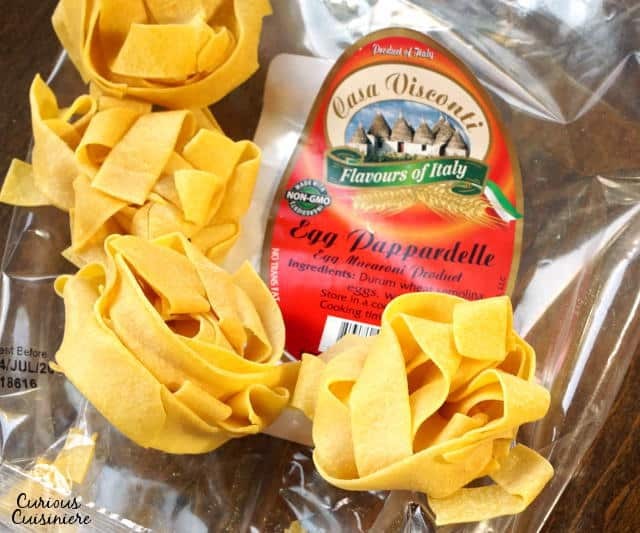 If tagliatelle isn’t available, it can be served with other wide, flat noodles like pappardelle (which we used and show in the image above) or fettuccine. PLEASE don’t serve bolognese sauce with spaghetti noodles. Can you imagine how that chunky, meaty sauce would fair up against those small strands? It would be a pasta disaster. Traditional bolognese sauce needs a wide, hearty noodle. Otherwise, everything (and we mean EVERYTHING) is all out of balance. 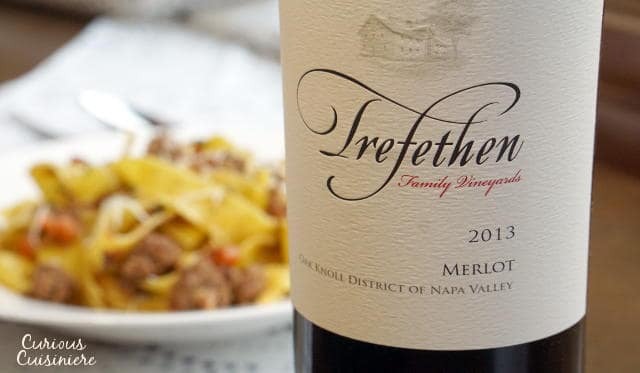 Speaking of balance, we made our bolognese sauce to pair with Trefethen Merlot wine for this month’s Wine Pairing Weekend, as we celebrate Merlot Month. 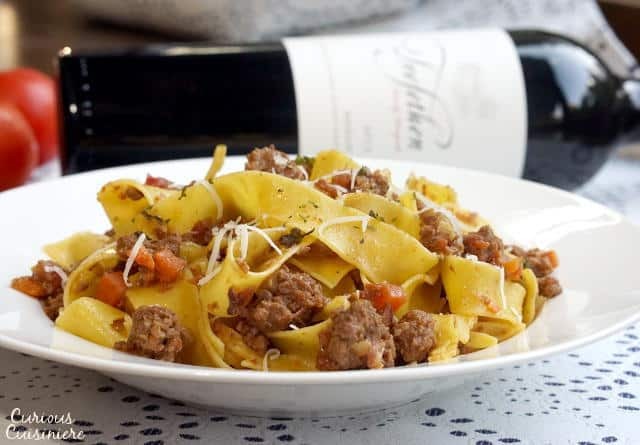 We were a bit scared when Tim’s brother told us that, in Bologna, Tagliatelle al Ragù is most often served with a bubbly wine, to cut through the fat and richness of the meat and cheese. But, we forged ahead, because Tim had serious visions of this ragù paired with a hearty Merlot. Upon uncorking the wine, we knew that we had opened something special. The Merlot was very aromatic with notes of black plum and leather on the nose. The first sip introduced us to a dry wine that was bursting with deep fruit flavors and balanced with just enough acidity to have a very smooth finish with hints of black plum. The pairing couldn’t have been better. 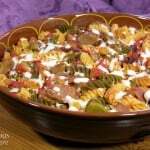 The fat from the meat in the sauce and the cheese smoothed out the dryness of the wine, leaving you with bold and deep fruit flavors. 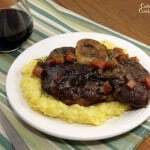 The robust flavors of the wine complemented the flavors of the sauce, without overwhelming it. And each readied you for a sip or bit of the other. They might drink bubbly with Tagliatelle al Ragù in Bologne, but we’d recommend this Napa Merlot as a great pairing as well! 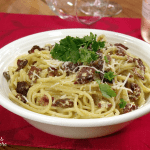 This richly flavorful meat sauce is sure to become a favorite pasta topping. In a large Dutch oven or heavy-bottomed pot, fry the diced bacon over high heat, 2-3 min, until the bacon begins to release its fat. Add the diced onions, carrot, and celery. Sauté the vegetables, with the bacon, over medium heat for 5 min, until the vegetables have softened slightly. Once the meat is browned, add the water (or wine) and deglaze the pan by scraping the bottom of pan with a wooden spoon to loosen any stuck bits. Add the milk and diced tomatoes along with the salt and pepper. Bring the sauce to a simmer, then reduce the heat to low. Cover the pot and let the sauce simmer for 4 hours, stirring occasionally. When the sauce is done, it should be thick, without much moisture. Taste the sauce and adjust the salt and pepper as desired. Serve the Bolognese with tagliatelle, pappardelle, or fettuccini pasta that has been cooked according to the package directions. Top with freshly grated Parmigiano-Reggiano cheese. DISCLOSURE: We received samples of the Merlot that we featured in this post. We were not compensated for our time. As always, all opinions are our own. Wine Pairing Weekend Group Takes on Merlot – Round Two! Our Wine Pairing Weekend blogging group (#WinePW on twitter) takes on a monthly wine pairing experiment/challenge. 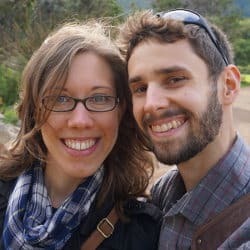 We get together online and chat about our results, celebrate victories and examine defeats. Last year, we had the opportunity to partner with the #MerlotMe group of wineries for the October month-long celebration of the much maligned Merlot grape. We both had so much fun they invited us back for round two! Take a look below at this collection of excellent pairing ideas for Merlot. I don’t think I’ve met a sauce I did not like. Thanks for the explanation on the differences. Your pics are gorgeous btw. 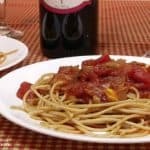 great explanation about bolognese & ragu sauces! your version looks delicious. 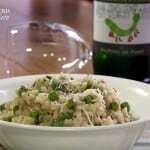 Interesting to here how well the Merlot worked with this Italian sauce! I am not going to say again how much I love the information you give in your posts. I can only say that so many times. Instead let me say that I really want some of this pasta, especially if you pour me a glass of Trefethen. I love pancetta, but agree, it isn’t always so easy to get your hands on and so much more expensive than bacon. We often substitute it with bacon. I absolutely love the photo with the cheese being sprinkled on top! Now THAT is a proper bolognese! Love the specifics on the ingredients and why they matter. Thanks for a fantastic recipe! Yes Amy, it is. 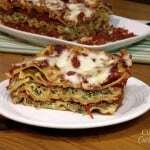 As we mentioned in our post, we took a look at the “official” recipe and made our own adaptations to it. Thanks for stopping by! I can’t believe the recipe is registered. Italians take their food seriously! There is nothing like a TRUE bolognese. Looks delicious! That they do! Thanks Jennifer!